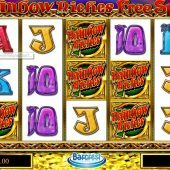 Rainbow Riches Free Spins slot is simplistically titled and basically provides exactly what you might expect from a game with 'Free Spin' in its name. 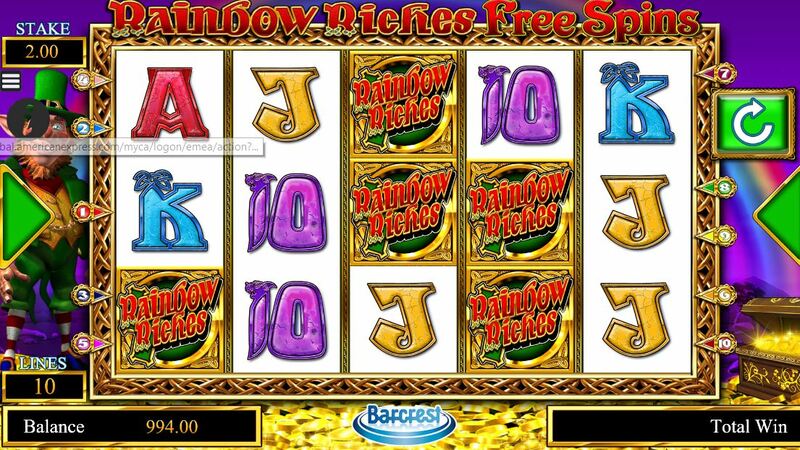 Barcrest, part of the global gaming entity Scientific Games, has created an army of Rainbow Riches-themed slots, such as Pick And Mix , Reels of Gold and of course the original Rainbow Riches slot. So how does the Free Spins version compare to these and other slots? The game is a simple 5-reel and 3-row grid and you get 10 pay lines. We get the familiar single and stacked card letters in their usual colours of purple 10's and red Aces etc. and naturally the premium Rainbow Riches logo symbol is present as usual with stacks that maintain the potential of a full screen win. Despite only 10 lines as opposed to the game's original 20 the maximum pay for this screen still awards 500x stake as 5-of-a-kind awards 50x bet. The volatility is far higher and this is exemplified by other pays, for example the Aces will award 30x, the Kings 20x and even the 10, J and Q pay 10x for 5. There are the original tinkling sounds and other effects when the reels stop identical to those on the original B3 UK land based arcade versions. There are single Wilds on all reels although you don't see them! If you watch the reels spinning you don't see them for some reason, only the scatters as they spin. There is no multiplier but there is the added benefit that scatters will also turn Wild when landing, as we shall see. The annoying leprechaun still appears on the left of the reels and may well do one of his jigs when you trigger the free games. There is a free spins icon on reel 1 that appears singly, 2 rows or 3 rows high. On reels 3 and 5 you have single ones and if you land them all single you are warded 10 free games, if the double appears on reel 1 you get 15 and 20 if the triple scatter lands in the trigger. The reels are enhanced during them so you see more wins and Wilds and have a better chance of another trigger, similar to the Novomatic 10-liners like Book of Ra Deluxe.